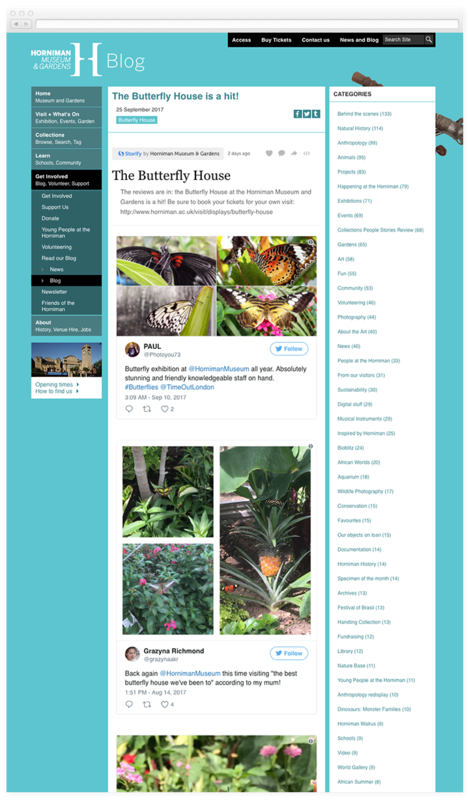 In designing this site we wanted something that was as varied and colourful as the Museum itself: the result is a joy to watch, comprehensive and easy to use. The museum itself is complex and multi-faceted, with five main collections, an aquarium and a garden and it offers continuous surprised and discoveries. 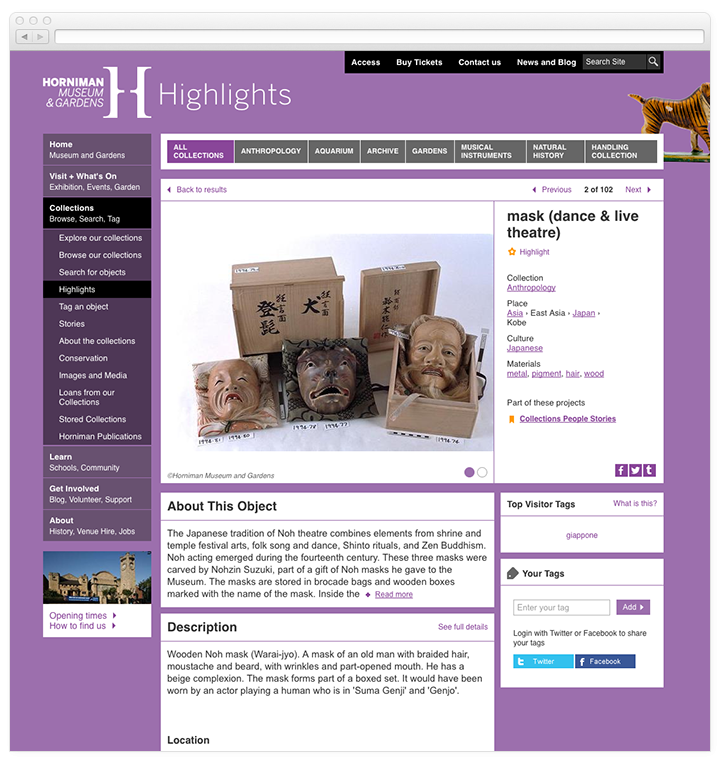 It is incredibly popular with families, schools and children, and at the same time constitutes a great scholarly research facility, due to the uniqueness of its collections. 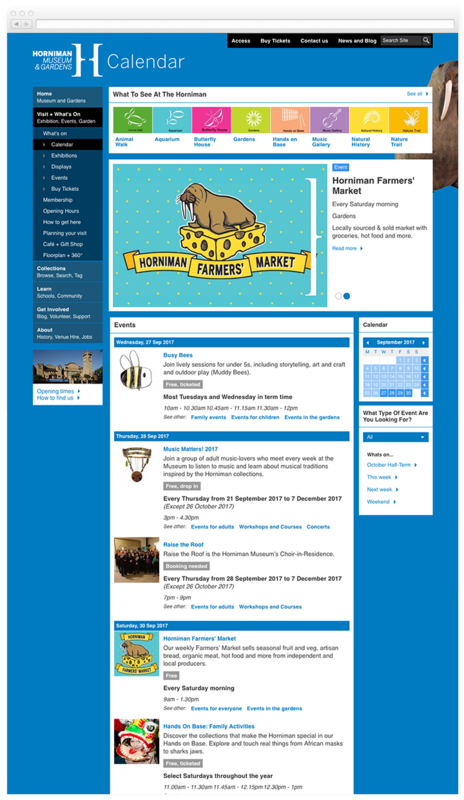 A lot happens at the Horniman Museum every day! 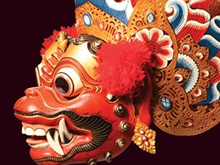 There are exhibitions to explore, five different collections to check out, a garden and an aquarium! The place is a varied as life itself - so is the website. There is a different and bold colour for each section of the website, giving an immediate sense of presence and recognition. Collection objects peek from behind the main content, to surprise and inspire... and invite new discoveries. Like in most of our projects, collection objects are the end of a journey and the beginning of many others. 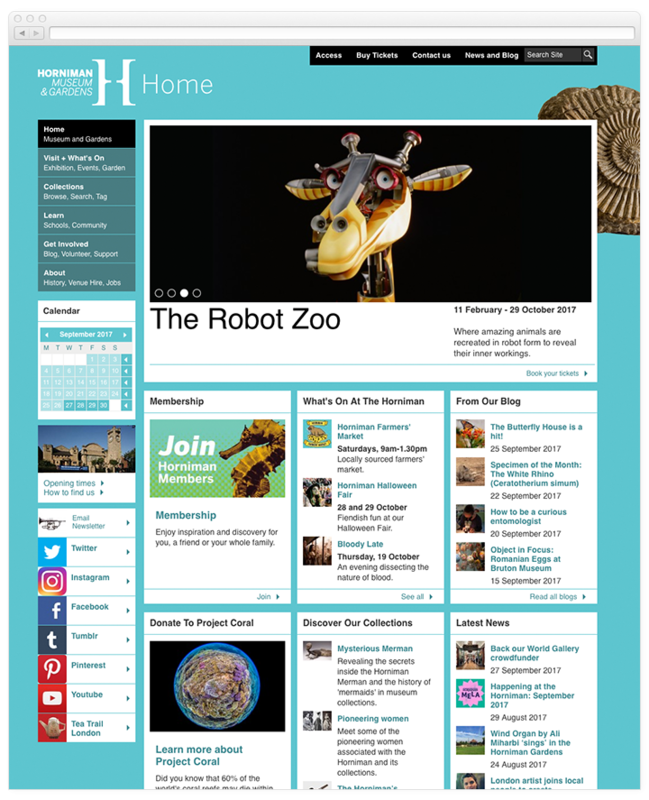 Qi allows the Horniman to create stories using objects as well as any other type of web content - inviting audiences to engage and participate. The collection is integrated from Mimsy Xg, using Apache SOLR. 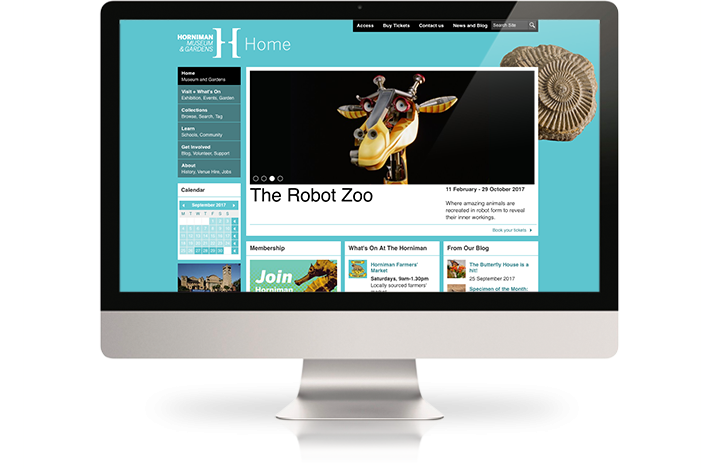 Qi offers comprehensive blogging facilities, which have been thoroughly exploited and integrated within the Horniman Museum website. The main advantage over a dedicated blogging platform, such as Wordpress, is that blogs can be seamlessly integrated and linked from any other part of the website. Fully integrated event management and booking, including purchasing of tickets and synchronisation with events management software at the museum. The shopping basket is part of Qi, including payment processing using Paypal. 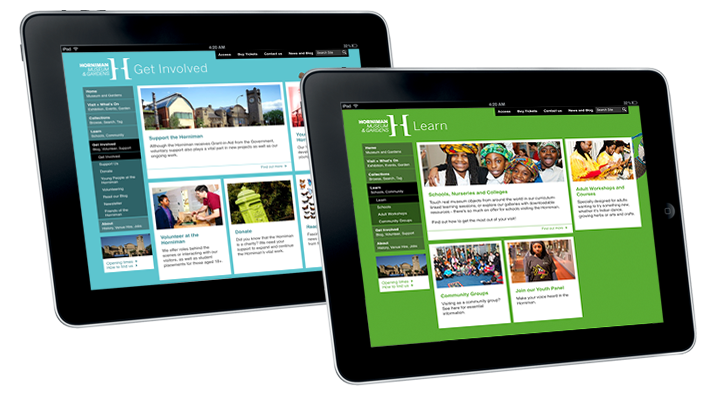 The whole website has been thoroughly tested on iPad, iPhone, Android and other mobile platforms. 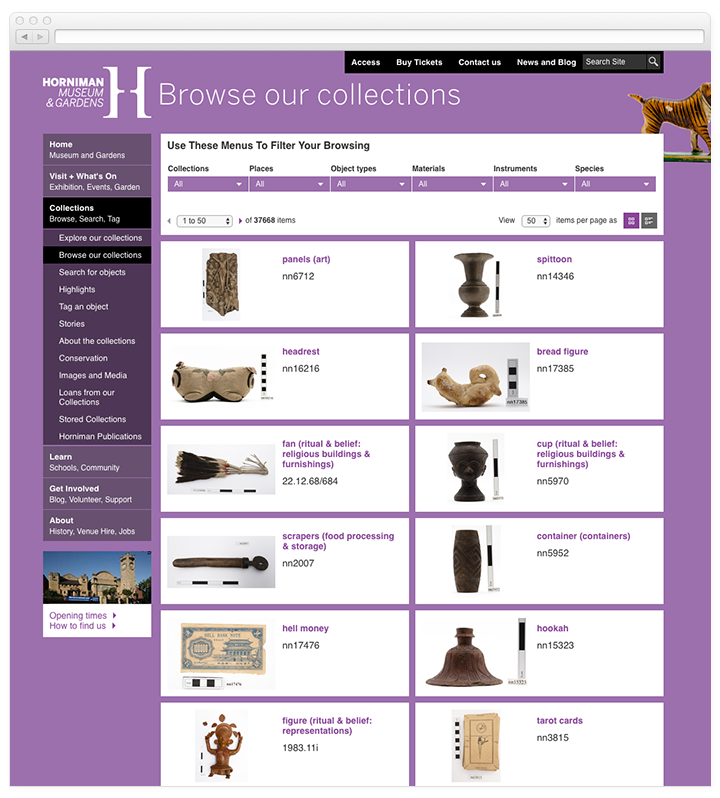 Our Qi CMS is used to manage both the website as well as Hornet, the museum Intranet, using a single repository and media library/digital asset management. 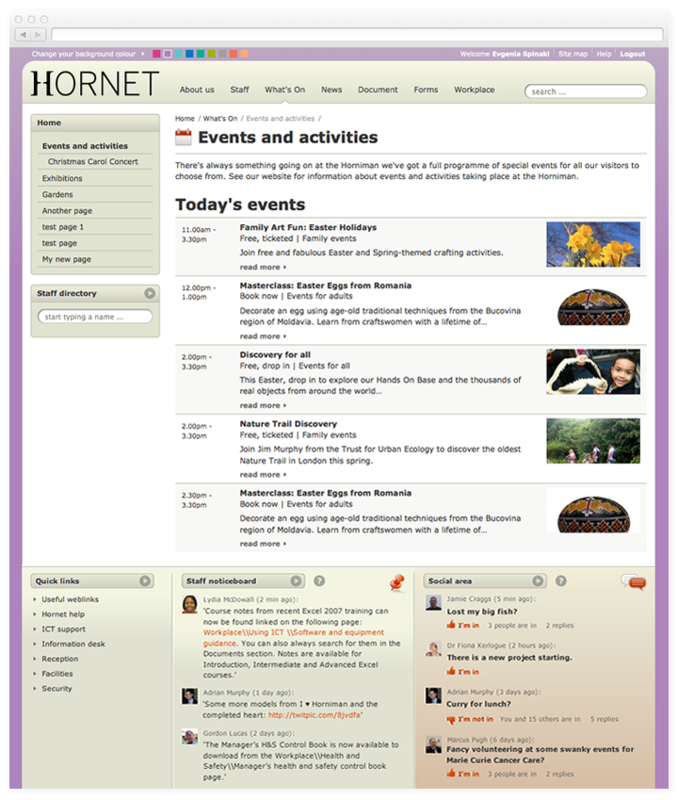 As an example, the Intranet automatically displays public as well as internal events - and everything can be cross-referenced.